Some will call it cockiness, some will call it confidence. Some will call it hustle, some will call it dirty. Whatever it is, there is nothing like a sports fans' love or hate for Duke University. They have managed to garner a reputation unlike any other college program in the country. One of the most storied programs ever, Duke is tied for third all time with five NCAA Men's Basketball Championships, all of which have come under head coach Mike Krzyzewski, better known as Coach K.
Among many of the reasons the majority of fans seem to hate Duke is the fans. The group better known as the Cameron Crazies lead chants directed personally at other players, and dress up in body paint in to protect their home court. Then there comes the floor slapping, flopping and taking of charges. All are basketball players just meant to get under the skin of your opponent as well as most basketball enthusiasts. Add in to what many see of a little officiating bias, and the Duke style of play sometimes is just frustrating for the college basketball fan. Still, it all boils down to winning, and the players we will be focusing on may have been hated, but nonetheless stood out as winners. It is hard for all of the nation to fall in love with a style of play we don't agree with, especially when it continuously ends in success. Hurley found himself on this list probably because of the Duke teams he played on. While the basketball fan in all of us was rooting for the likes of UNLV with Larry Johnson, Stacey Augmon and Greg Anthony in the 1991 Final Four, or Michigan and their Fab Five consisting of Chris Webber, Juwan Howard, Jalen Rose, Ray Jackson, and Jimmy King in the 1992 championship game, Hurley was winning back to back titles with Duke. He was on the teams that consisted of Christian Laettner (more on him later), and Grant Hill. Hurley was a great college basketball player but career didn't translate much to the NBA, as his career was shortened by a near-fatal car accident during his rookie year. In all, he played five seasons and averaged 3.8 points for his career. Mike Dunleavy falls into our hustle vs. dirty plays category. He actually is still carrying that reputation through the latter part of his NBA career as well. Dunleavy was the prototypical "smart" basketball player who did a lot well on the court. He played for Duke from 1999-2002 where he won a NCAA Championship and earned second team All American honors. He played on one of the more hated Duke teams that included Carlos Boozer, Chris Duhon, Jason Williams, and Shane Battier, all of whom could have earned a spot on our list according to some fans. Golden State Warriors fans may also have a reason to hate Dunleavy, as he was selected by the Warriors ahead of the likes of Amar'e Stoudemire, Caron Butler, and Duke teammate Carlos Boozer. Dahntay Jones is the first player on our list that did not win a NCAA Championship, but lands on this list mostly because of his signature moment in college. In a game vs Virginia during the 2003 season, Jones drove the lane and dunked on the defender only to land and add some push ups as he celebrated. Obviously the dunk was memorable and powerful, but it was just another reason for basketball fans to point and ridicule the University. Jones played two seasons with Duke after transferring there his junior season. He made it to the First Team All-ACC and two First Team All Defensive ACC teams while there. Jones went on to win a NBA Championship with the Cleveland Cavaliers in 2016. Austin Rivers carried himself on the court as if he was the greatest to ever step on the hardwood. And this may be a case of our cockiness vs confidence measure, but still he always seemed to go over the top. I am sure University of North Carolina fans agree with his inclusion here as well, due to a game-winner he hit during the 2012 season. Rivers was a good college basketball player who decided to leave for the NBA after just one season at Duke. In that season's NCAA tournament, Rivers and his Blue Devils were defeated by number 15 seed Lehigh in the first round of the tournament. Unlike some players on this list, the haters got the last laugh on this member of our list. Kyle Singler was another Blue Devil who probably made this list for being so fundamentally sound he became boring and annoying, Singler spent four years at Duke earning All-ACC, All-American, and Final Four Most Outstanding Player honors on his way to a NCAA Championship in 2011. Singler was simply known for his over-the-top confidence and arrogance, once stating that Duke just didn't bring it following a 31 point win over Presbyterian College in 2008. Singler was drafted by the Detroit Pistons in 2012 where he played just over two seasons before being traded to Oklahoma City, where he watched his playing time decrease steadily since entering the league. Ferry was at Duke before they landed their first NCAA Championship, but he did lead the Blue Devils to three Final Fours during his stay. 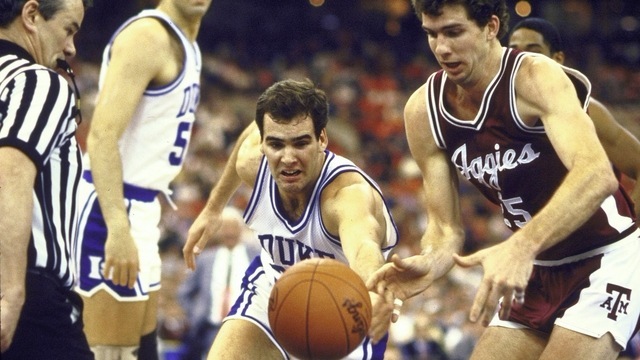 The Naismith College Player of the Year in 1989, Ferry also added All-ACC honors and All-American honors during his time at Duke. Like most of the players on our list, Ferry was just a cocky player that carried himself in a manner which attributed to feeling he was better than the rest. Partially true I guess, since he landed Player of the Year honors. Ferry took on the hate before it all started to pile on Christian Laettner. You could say he helped bring on the traditional hate on the Duke program. Henderson wasn't always viewed as a player that attracted hatred, he was an athletic player with an engine on both sides of the court. He lands on this list for one incident. When losing in the final moments of the game to rival University of North Carolina in 2007, Henderson delivered an elbow to UNC star Tyler Hansbrough. He bloodied him up and caused one of the more historic photos in the history of the rivalry. Henderson did not win a NCAA Championship but did manage third team All-American honors, and also made first team All-ACC. Henderson is currently with the Philadelphia 76ers, his third team in eight seasons in the NBA. Paulus was almost left off this list simply because he may have punished himself enough. His willingness to take any charge ultimately landed him on the harsh side of a lot of poster dunks. Paulus was a duel sport athlete out of high school, earning McDonald's All American honors in basketball and the Gatorade National Football Player of the Year award as well. Paulus was a three-year starter for Duke's basketball team until losing the job his senior year to Nolan Smith. Paulus did play a year of college football as well with Syracuse University, where he went 4-8 with 13 touchdown passes. He was unable to land a career in either sport following his stays at Duke and Syracuse. A tall, unathletic center with a pretty cool name just had to be a Duke Blue Devil. Parks takes the spot for guys like Brian Zoubek, and although ultimately more athletic, the Plumlee brothers. Parks helped Duke to the 1992 NCAA Championship in minimal minutes alongside Bobby Hurley, Christian Laettner, and Grant Hill. He played all four years at Duke and in 1994-1995 put up career highs of 19 points and 9.3 rebounds per game. That was enough to have him drafted 12th overall in the 1995 NBA draft. There the hatred only grew, as Parks began covering himself head to toe in tattoos while playing for NBA teams in in a largely unsuccessful nine-year NBA career. To go along with the charge-taking and floor-slapping that made Jon Scheyer into the college player he was, he also added some of the weirdest facial expressions to his hatred resume. Scheyer was actually a very sound player for the Blue Devils, starting the majority of games for three out of his four years at Duke. He was able to help the Blue Devils to the 2011 NCAA Championship alongside teammate Kyle Singler. Scheyer spent one preseason in the NBA where he averaged zero points, zero rebounds, and .5 assists. A nice college player, and thank you, NBA, for ending the Scheyer face in college. Wojciechowski is probably the least accomplished player on our list, but he is better known for starting the floor slap on defense. So much that opposing teams and fans use it as a taunt against Duke to this day. I guess it worked out for him somewhat, since he was able to grab a NABC Defensive Player of the Year award, and an honorable mention All- American nod. From 1994-1998 Wojo posted career numbers at Duke of 5.4 points per game, 3.9 assists, 2.3 rebounds, 1.6 steals, and zero blocks. Wojciechowski can currently be found on the sidelines with Marquette University where he serves as the head coach. I wonder how long they spent on floor slapping in practice. JJ Redick was good in college. So good, that it was just too easy to end up hating him. Redick, of course, added fuel to the fire by feeding into the heckling and boasting and taunting opposing fans after each shot and big play. Redick was well aware he was hated, and in part due to the university he was playing for, and due to the fact that he wanted to have opposing crowds boosting his competitiveness. Redick was a College Player of the Year in 2006, a two-time winner of the Adolph Rupp Trophy, two-time first-team All-American, one-time third-team All-American, a two time ACC Player of the Year, and has his number 4 retired by Duke. Unlike most of the players on this list, Redick has put together a solid NBA career as well. I gave some credit to Steve Wojciechowski for kickstarting the flopping, diving, and dirty plays that Duke has come to be known for. But we can't take the credit away from Chris Collins for really planting the idea at Duke University. Collins played all four years at Duke, adding a second-team All-ACC his senior year, but the way he carried himself on the court, fans would have thought no one was better. Collins finished his college career averaging 9.1 points, 2 rebounds, 2.4 assists, and .9 steals. His senior year was the best of his college career when he bested all those career averages. The son of accomplished coach Doug Collins, Chris is currently the head coach at Northwestern University. He lead them to their first win ever in the NCAA tournament. Allen could probably take the number one spot, but until ESPN comes out with "I hate Grayson Allen" or some kind of pun on his tripping of opponents, were going to keep him safely at number two. It's simple to see why fans, coaches, opposing teams, and maybe even his own fans and teammates don't like Grayson Allen. On numerous occasions he has blatantly tripped opposing players, and went on to pout and throw temper tantrums on the bench afterwards. What's sad is that Allen is really a heck of a player. Now in his third season at Duke, Allen helped the team to the NCAA Championship in 2015, and has earned All-American and All-ACC honors. He is currently leading the Blue Devils through the NCAA Tournament again. Well, if you didn't already know, then go check out ESPN's 30 for 30 special named "I Hate Christian Laettner". Laettner was good and he carried himself on the court with the attitude showing that he knew it. tHe hatred spawned from jealousy but turned up a notch out of dirty plays and continuous winning. His Duke teams also beat some of America's favorite teams in the UNLV Running Rebels and Michigan's Fab Five. Although he was a part of the 1993 Dream Team, and did make an All-Star game, luckily for most fans Laettner was not a great NBA player. But his college resume is enough for him to be remembered for a long time, whether we like it or not. Laettner's Duke accomplishments include two NCAA Championships, the 1991 Basketball USA Male Athlete of the Year award, a Naismith College Player of the Year award, two All-American honors, an ACC Player of the Year award, and his number 32 retired by his alma mater.